Sega has followed Nintendo in pushing 3D “remakes” of their classic games to the 3DS eShop under a Sega 3D Classics banner, although the former competing console makers have chosen different approaches. Nintendo added features, tilting Urban Champion at an angle to better expose depth. Sega avoids such gimmickry and instead focuses on keen emulation of their arcade/Genesis titles. Four choices are available (more to come) including arcade versions of Space Harrier & Super Hang-On with the Genesis edition of Altered Beast joined by the original Sonic the Hedgehog. These are die-hard ports where details are numerous such as emulating Sonic on the Genesis 1 or Genesis 2 remodel, and Space Harrier replicating the cabinet motion (and arcade audio ambiance) if you choose. Key here is of course the 3D effect and it’s marvelous. Sonic’s parallax scrolling depth has always been under appreciated, shining in 3D with those layers beautifully positioned to maximize pop. Trees intersect one another, and smaller sprite details shine. 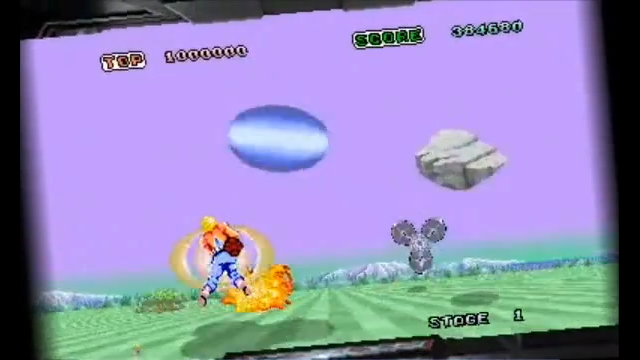 Space Harrier jumps from the screen as it always has with another layer to gawk at, accentuating another layer of intense exaggeration which remains the hallmark of the forward scrolling shooter. Sega’s only blunder is title selection. Altered Beast remains crud, more so in its Genesis incarnation. Why they chose to port the home console edition instead of the arcade is odd (although there are technical reasons; see the linked interview above). Super Hang-On is much the same, although presented in its arcade form. It’s a generic racing title with nostalgia being its only notable factor. Still coming? Streets of Rage amongst others with the promise of more if these sell well. These would be fantastic in a compilation cart at a discounted rate. Paying $6 each is quite steep, although the work applied to generate the 3D effects is appreciated. Hopefully sales are up to expectations. Vintage titles with this level of sharpness and a little extra on the go is worth the entry cost.